On a perfect day there will be some freshly baked treats to greet the children when they come home from school. The reality is on most days I’ve been too busy to bake and, well, there is always a piece fruit to fill those hungry tummies. 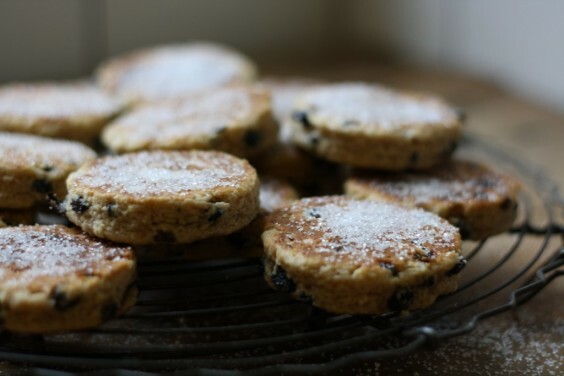 However on the days when an apple just won’t do, one of our favourite afternoon treats are these little Welsh cakes. 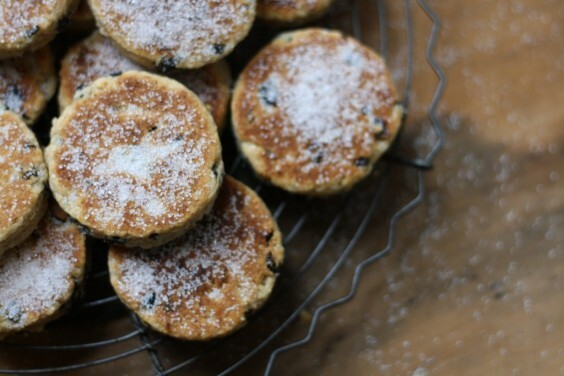 A traditional snack in Wales, these warm buttery little cakes have the beauty of being cooked in a frypan. No waiting around for the oven to get hot. Made with pantry staples, quick to mix and even quicker to cook, these little treats can be whipped up while the kettle boils. And they are so easy you could even get the children to help while you have a cup of tea after your busy day. Afternoon snack and activity all rolled into one? That sounds like a perfect day! Rub with your finger tips until the mixture resembles bread crumbs. It doesn’t have to be perfect. Mix in the sugar, currants, lemon zest and beaten egg and stir to form a dough, add a splash of milk if too dry. Try not to work it too much or your cakes will be tough. Cook each cake for about 4 minutes each side or until golden brown – check them often to make sure do not burn. Sprinkle with caster sugar and serve straight away, traditionally with a pot of tea. Or you can split them like a scone and top them with whipped cream to be fancy. Apparently they keep in an airtight container for up to four days, but honestly, they've never lasted long enough to test the theory. oh how perfect! and with the start of our school year just around the corner this recipe looks like the perfect thing to make. They are such an easy recipe to have up your sleeve Rebecca. Oh these look good. I copied a recipe from the River Cottage Baking handbook. Maybe when the girls are older so I can share them! When you are after fun party catering desserts, then this sophisticated welsh cakes are the perfect menu for you. I tried this as well but I tweaked it a bit. Using the ingredients I had on hand, I added a personal touch on those cakes. I also created a different presentation to boost the appearance of the cake. Right as a Welsh girl I have to say...these are gorgeous! The recipe is perfect. Best cooked on a griddle or hot plate if you have one but anyway they are gorgeous. High praise indeed! Thanks so much Rachael! I just made these this afternoon and they were delicious. And you are right, they were made and on the stovetop in about ten minutes. Thank you!! I'm so glad you made them Deborah, and that you like the recipe. Thank you! That's how I like to eat them Naomi! These look delicious - I've never heard of welsh cakes. They are quite unusual like pan fried scones almost. I'll have to try them. That's exactly what they are like Elizabeth!